This little camera is a Kodak Duaflex, which was discontinued back in 1960. I come from a LONG line of pack rats, so it should be no surprise to learn we still have the thing around! 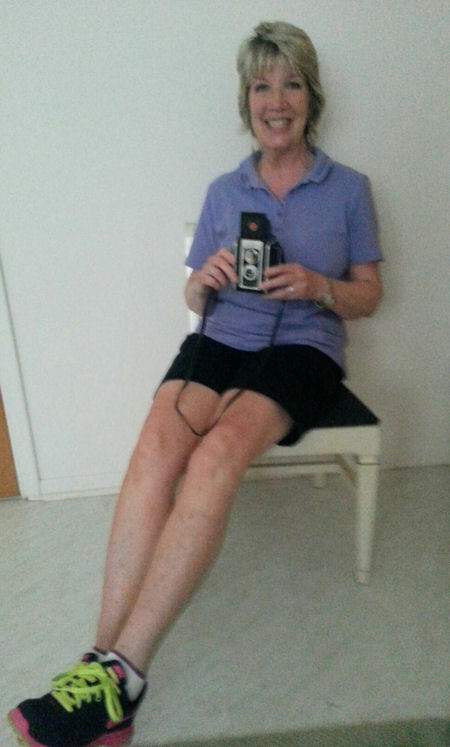 This entry was posted in Uncategorized and tagged photography, selfie, today me, young me. Bookmark the permalink. What fun photos. I had a rocking chair much like that when I was a kid, too. The seat on mine was solid, though. And I remember the Brownie camera I had. It was square — a different version. But I can remember the process of changing the film — and how long we had to wait to see how our photos came out! I grump about some technology, but I do love me some digital camera! You know, despite everything, I’ve observed that people’s smiles don’t change over the years. We may get wrinkles and gray hair, but those smiles stay around. Thanks, Linda. This post began as a traditional Throwback Thursday, but then I checked in the place where I’d last seen this camera stored, and there it was! Since I find Young Me/Now Me (http://www.zefrank.com/youngmenowme/) a source of endless fascination, I decided to see if I could recreate something of my own. You’re sooo right — digital cameras are the best. Instant viewing, toss away the “dogs” — what could be better?! Thanks for indulging my silliness! Love it! It seems you were a cutie-pie right from the very start. And what a gorgeous smile! It is very cool how you still have the camera. Your post today has given me the biggest grin – thank you! Aw, shucks, Lucy, you’re making me blush! I probably should have combed my hair for this one, but at least my mom did for the “young me” version. 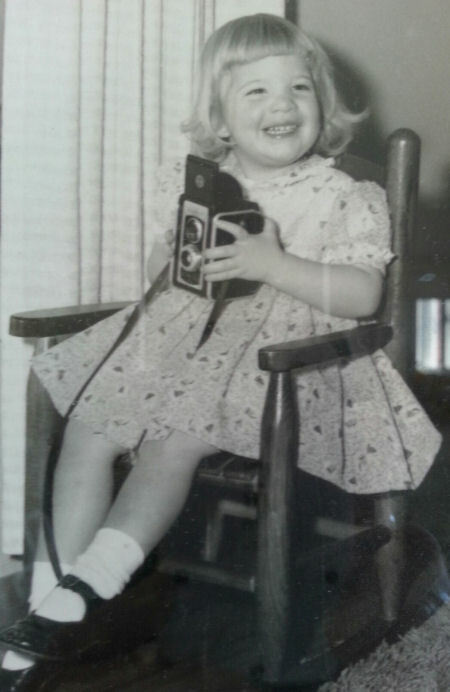 As for that camera, I guess it was a useful prop to keep a fidgety little girl still — and things don’t change, even when the little girl has grown up, ha! Little girls never truly grow up, I think! Especially cheeky ones like us, I would say. Hair combing is only for the most formal of occasions. Don’t tame the mane! You found me out, you know. That’s one reason I got it cut in a bazillion layers, so it wouldn’t *need* combing, ha! Mine is the same. Mostly, I look like a homeless lion. You absolutely do NOT — you look quite fetching, I think. Homeless lions make me think on poor Cecil, and my heart breaks over his death. Oh poor Cecil! I get so furious every time I read something else about him. That dentist is a horror. I don’t like to wish ill on others, no matter they have done, but I certainly wish him an infected wisdom tooth. I had one once, it was dreadful. Also – I only look quite tidy in these photos here – in real life I am something akin to a bag lady! I’ve got a rocking chair just like that, can you believe!! So, I love both photos to many deaths. You look very happy…and a bit mischievous! Do you really, Professor? I find that awfully cool! I didn’t want anybody scratching around and trying to “age” me because of my props, you know. Mischievous? Well, yes, I reckon so, at least a bit and then some! I do! That’s right. Mischievous is good! Such a nice smile. I have to admire the fact that the camera is still with you. I had one like it and have no idea what happened to it. Great post. Thank you, John. Some museum somewhere would probably love to have this camera in its display case, but I can’t see parting with it. Too many memories, I suppose. OMG Debbie, this is such a GREAT post! How adorable you are (then and now)! And as others have shared, your smile is fabulous! It’s like a beacon! Isn’t it something how when we look at pictures of ourselves from our childhood, our smile stays exactly the same! I remember that camera very well because I pretty sure my mother and father had one in the late 50’s – early 60’s. I’m so impressed that you still have it! What a fun post, my friend. Totally loved it! Have a great rest of your week! Ron, you’re just making me blush, you know — thanks for the compliment! It’s funny how many of my “young me” photos were more on the serious side, many with my eyes clamped firmly shut! Perhaps that’s why I like this one, because it shows a truly happy little Debbie. Y’all had one of these cameras, too? Wow! When I researched it online and found how very popular this thing was, I guess I shouldn’t be surprised. My folks weren’t well off, and photography was an expensive “habit,” so it’s no wonder this camera hung around waaaaay past its phasing-out date. Glad you enjoyed this one — have a fabulous Thursday, my dear! I challenge you to take a selfie with that, Debbie! That’s a definite keeper all around — camera and photos! Bless your heart, FF!! My dear mom took this photo. She’s about four feet tall, so of course, the angle makes me look like a spider monkey, ha! What a lovely compliment — much appreciated, you know! *laughing lots* Oh, my. Dear mom wouldn’t appreciate that at all! ‘Tis hard enough for her to find clothing that fits properly. Don’t the designers know not every woman is six feet tall and 95 pounds sopping wet?!! So cute. You were a darling little girl and you grew up real nice too! Aw, shucks, Kb — thanks for saying that! My dear mom always used to remind me, Pretty is as pretty does. I tried to take it to heart, but I can remember more than one occasion where I failed miserably, ha! What a fun look at now-and-then! I come from a family of pack rats as well. I wouldn’t have to look far to find something from way back that’s still around! I’m glad you understand, Terri. That’s one reason I’ve been fascinated with your stories of relocating your mom and dad — because I *dread* the thought of having to parcel stuff out! Seems like it would be so much easier if we knew when we were leaving this world and could dispose of our “treasures” as we see fit! You look utterly adorable! We had one of those cameras, too, and my father would constantly take photos of us. It was annoying then but I’m grateful now. Can’t believe you still have yours. Jealous! Monica, the thing probably still has film in it! Who knows what “treasures” would show up if we could open it?! By the way, that glowing red spot is me blushing at your too-kind words!! You were so cute!!! Love those Mary Jane’s. Kids still wear them. You were a foxy mama…great legs! I’m glad God let’s us age slowly. I’m still shocked at what I use to look like and what I look like now. It’s still gets me when people call me “Ma’am”! Aw, I’m sure you were a cutie, Tanya! Yes, we all change over the years. My toddler self is way different from my today look, but it’s what’s on the inside that counts, right? And, since we must all age (or at least, the lucky ones among us! ), we might as well make it graceful — your mama was right!